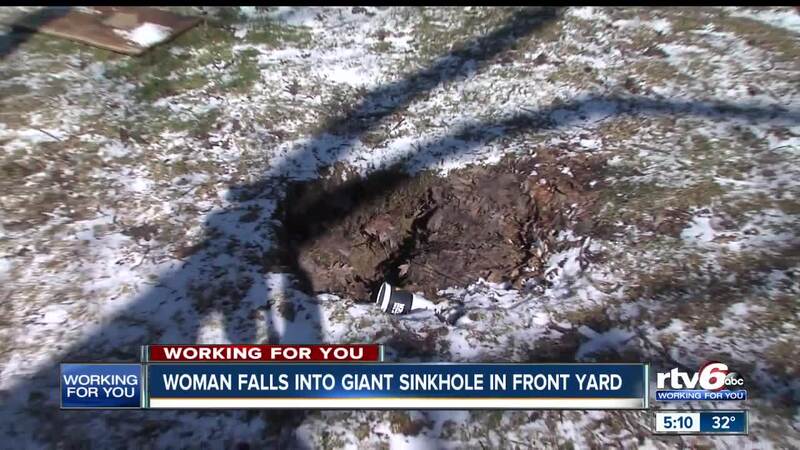 An Indianapolis woman trying to get a sinkhole removed from her yard is caught in a runaround. INDIANAPOLIS — It's been two-months since Gracie Gordon first encountered a sinkhole in the front yard of her Kessler Boulevard home. It happened as she was taking the trash to the curb. "All of a sudden I was down in the hole. I mean I just literally sunk down into the hole," said Gordon. She called the Mayor's Action Center which sent an inspector who determined the hole was a couple of feet from a Citizens Energy manhole. Meanwhile, Gordon did her best trying to fill in the hole with seven bags of soil, each 40 pounds. But the hole keeps getting bigger and Gordon worries. "I'm concerned about the danger of it because people walk up and down the street in front of my home all the time," she said. RTV6 got in touch with Citizens Gas which says a report was made but the repairs were not done. The utility is not sure why, but it promises the work will be done as soon as possible.